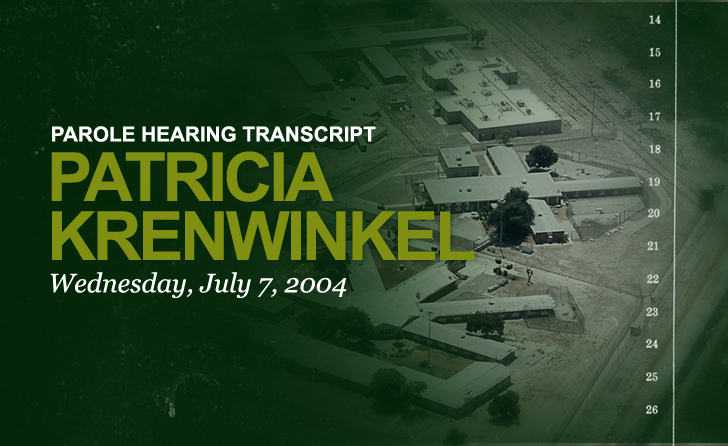 Jan. 9 – On the afternoon of Wednesday, July 7, 2004, a California parole board found Patricia Krenwinkel unsuitable for parole at a hearing held at the California Institution for Women in Corona. Relatives of Sharon Tate, Jay Sebring and Leno LaBianca attended the hearing along side of Deputy District Attorney Stephen Kay, all of who opposed Krenwinkel’s release. The panel review revealed Krenwinkel to be a model prisoner with no write ups. She excelled in many of the prison programs and was praised as an excellent worker. But an unfavorable psychiatric report overshadowed her positive post-conviction record. Krenwinkel’s lack of insight was evident in the hearing itself. When Comissioner Al Angele asked Patricia about the 12 steps program – in particular, step eight, people who she has caused harm to. “And who is on top of the list?” questioned Angele. “Probably myself, first,” responded Krenwinkel. Krenwinkel was denied parole for three years. It was her 12th appearance before the board. Patricia Dianne Krenwinkel was born on December 3, 1947 in Los Angeles, California. Her parents divorced when she was 17 years old. At the time, Pat stayed in California with her father – an insurance agent – while her mother moved to Alabama. After High School, Pat moved to Alabama to live with her mother and attend a Catholic college. She had taught Sunday school in the past, and had thought about becoming a nun. After only one semester, Pat had enough and dropped out. She moved back to California, where she moved in with her half-sister Charlene, and got a job as a processing clerk. In September of ’67, she met Lynette Fromme, Mary Brunner, and Charles Manson on Manhattan Beach. After making love with Charlie, Patricia decided to go with him and the girls to San Francisco, leaving her car and final paycheck behind. You have an amazing site!Thank you for all your post.I hope Katie dies in prison.That comment that she hurt herself the most.She has no remorse! You guys have an incredible site! I am amazed at the content! Keep up the great work! She is Not evil and to say she has no remorse…that’s an evil thing to say. I heard her agonized outburst to Patti Tate, agonizing remorse. Patti Tate was so affected by it, she had to fight it off, she said something to the effect afterwards that she believed it…you couldn’t not believe it, a top actress couldn’t have got that much pain into the voice…but Patti said, essentially, she didnt want to forgive Patricia and if she allowed herself to acknowledge the remorse, she would have to. She has suffered and suffered for what she did and knows well what she has caused. These doctors just dont want to let her out. She was very young, and if Linda Kasabian could be under Manson’s control after one month, well, Pat was there from the start. She didnt know she was being sent to kill, she followed an instruction. As for her comment…here is the insight they say she doesn’t have. She meant she had harmed her own soul, her goodness. she harmed herself first..then others.